Justin tossed his combat harness into the coat closet, followed a moment later by his boots. As he headed for the kitchen he shrugged off his uniform shirt--Tunic, he corrected himself. He sniffed his shoulder and grimaced. Sweat and burning Soul Drinker. Woof. I need a shower. "How'd it go?" Dad called from the other room. Justin could have told him about the mop-up operation in Woodland Park, how he leaned out of a helicopter to shoot the liquid-ethereal Soul Drinkers milling around the streets, or how his not-quite girlfriend had hacked them with her magic sword. He could have made it a whole thing, but instead he just shrugged and opened the fridge. No sense worrying him any more than he already is. "Fine, I guess. We got them all." "Good. Good. Package came for you right after you left," Dad said coming into the kitchen, eyes fixed to his phone's screen. When he looked up he sighed. "How many times do I have to tell you kids? Don't stand there with the door open. Decide what you want and then get it out." "Sorry," Justin muttered, cracking open his soda. Help save a town-full of people and get chewed out for wasting like three cents of electricity. My bad. "Sure. Sure. Glad you're home safe. I'm mighty proud of you, kiddo." A twinge of sorrow​ and guilt tugged at Justin's heart. "Thanks, dad." He wanted to say more but didn't know what, and instead Justin headed for the door. He paused beside the kitchen island. A black package with the words "Loot Crate" in the corner sat waiting on the mottled gray counter-top. He'd heard about this. Some sort of mail-order mystery package company that sent geeky stuff every month. But he hadn't ordered it. Wonder where it came from? A small thrill of excitement shivered through him. Hm. Cool. A book waited at the bottom of the box. A book entitled Terra Soul. On the cover-- black sword in hand, facing down a horde of soul stealing monsters, her back to a vortex of color--stood a slim girl with an unruly mane of pale blonde hair. She wore a black coat, the tails of which were made from looped cords. The face wasn't quite right, though it had been rendered in a toony comic-book style, but there was no denying it was Ayla. Ayla his almost-but-not-quite girlfriend. Ayla saving the world. Justin grinned. He ran his hand over the satiny cover expecting her image to change. It remained. He couldn't help but laughing. "What is it?" Dad asked, emerging from behind his screen. "It's her story. Ayla's story. And my story too, I guess. Ayla's going to flip!" 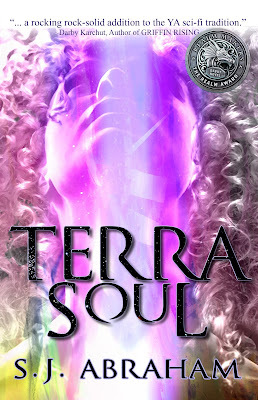 If you'd like to find out more about Justin, Ayla, soul drinkers or their story, please, check out my novel Terra Soul or the accompanying website TerraSoulStories.com.